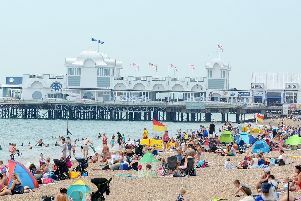 Portsmouth basked in warm temperatures and sunshine throughout the final week of March but the Met Office is predicting more unsettled weather over the coming days. After highs in the mid-teens last week, temperatures are set to plunge to near freezing from tomorrow. While heavy rain is also being predicted and more overcast conditions are set to come throughout the week. Across the country there is chance of snow, the Met Office has warned. Met Office forecaster Craig Snell said some places will see frost at night, while mountainous areas of Scotland may see snow. ‘It's really a week of April showers, a mix of rain and some snow on the high ground and some hail,’ he said. Mr Snell said remote areas of Scotland and Wales could see temperatures fall to as low as minus 5C at night, while temperatures in other areas will hover around freezing.